Want to give someone else a very special gift! You can give that special someone the gift of dance, martial arts, or any service Oriental Phoenix Arts offers. CLICK HERE and purchase a preset amount gift card, classes for a month, or create-your-own custom gift card in any amount you choose. Cards may be used to purchase fitness/wellness services, group class pay-as-you-go fees, group/private lesson or fitness/nutrition packages, and applied towards memberships. 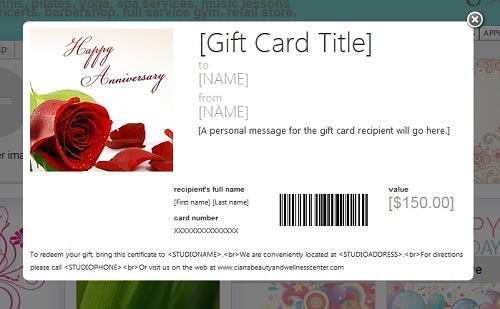 You can even custom design your gift card! Print it or send it to that special person in an email. – Gift Cards are not redeemable for cash and cannot be returned for a cash refund. – Any unused balance of the gift card will remain until redeemed. – If a purchase exceeds the amount listed on the gift certificate, the redeemer is responsible for paying the difference at time of purchase. – For security purposes, a recipient may be required to show valid ID before he or she can redeem the gift certificate. – OPA is not responsible for lost or stolen gift cards. – OPA reserves the right to contact gift certificate purchasers, or known recipients, to remind them of gift card. – OPA is not responsible for emailed gift cards that do not reach their intended recipient for reasons beyond its control. Bounced email is not monitored. Receipt of email cannot be verified. – OPA reserves the right to change these Terms and Conditions from time to time in its sole discretion.